Flowers are one of the central symbols of a wedding. The bride's bouquet and choice of flowers will determine the wedding's color scheme and the bridesmaid's dresses, as well as providing color and festivity to the ceremony. However, paying a florist to arrange the flowers for the bridal bouquet, bridesmaids' bouquets, groom and groomsmen's boutonnieres, mother of the bride corsage, mother of the groom corsage, and everything else can cost a fortune. By purchasing your own flowers in bulk, you can save huge amounts of money. The trick with wedding flowers is to understand what you will receive and what the bride wants. If the bride is looking for four-foot towers of intricately arranged rosebuds, you will want to hire a florist. If the bride wants a vase of flowers on each table, that is something a non-florist can achieve. By purchasing flowers and filler flowers in accent colors in bulk and buying vases in bulk from online retailers or floral supply stores, you can save a lot of money and still get a polished, beautiful set of arrangements. The big question is flower selection. If the bride already has her wedding colors picked out, she should look around on bulk flower sites. Many allow searches by color, making the process easier. Some wedding sites also offer prearranged centerpieces in bulk for cheap. These arrangements tend to be extremely basic, tending towards only white roses, but can be personalized by adding a few smaller flowers in the wedding colors. For example, if the bride chose yellow as a color, you could remove one or two roses and make room to add miniature daisies, small black eyed susans, or miniature daffodils throughout the white roses. This would add attractive yellow accents and personalize the table arrangement. Once the bride has the perfect flowers selected, figure out what kinds of arrangements you will need. The common types of standing arrangements are ceremony flowers to go on the altar (if a church) or on tables by the area where the officiant will stand (if a secular facility) and flowers for the tables in the reception hall. Some brides also add a small arrangement to a table outside the reception hall where the guest book and place cards will be stored. Typically, the standing arrangements will be the most expensive overall, as you need more of them. Happily, as they tend to be in vases, it is easier to create these yourself from bulk flowers. Bouquets, corsages, and boutonnieres are slightly more complicated. The bride and bridesmaids will need bouquets, the groom and groomsmen will need boutonnieres, and the parents of the bride and groom typically receive corsages and boutonnieres. All of these arrangements involve some basic knowledge of how to use florist's wire and wire wraps. If someone in the wedding understands how to create a bouquet or corsage, it is certainly possible to do it yourselves. Alternatively, bulk flower sites often give discounts on basic prepared corsages and custom bouquets. 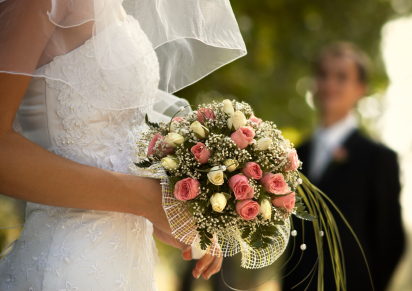 Before purchasing flowers, check with the reception hall and ceremony location. Some places have extremely specific rules about floral arrangements. Typically, these restrictions cover whether loose rose petals are allowed and how long before the ceremony the flowers may be set up. However, some venues ban amateur floral arrangements all together, preferring to work only with professional florists. Be sure that your venue will allow your flowers.